The work How Love Lasts, staged at the Echo Theatre in Atwater Village, I can safely say surprised. Readers of this blog may well know I enjoy the edgy, the macabre, the fierce on stage. But other virtues deserve plenty of credit as well, which makes for an excellent reason to praise really funny comedies for instance. Or, as in this case, to praise the qualities of gentleness. And kindness. Angst is easier, because it is more conflicted. Harder is the examination of genuine emotions in which the positive ultimately shines like a light. 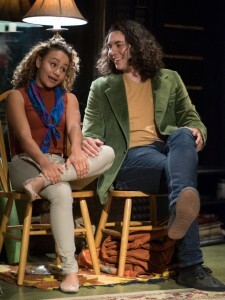 Not impossible, certainly, but usually playwrights use tragedy as a counterpoint to make the light all the brighter, to give at least a few drops of the bitter to make the sweet less cloying. So with How Love Lasts, but with a remarkably gentle touch. Creators (i.e. writers, director, music composer, etc.) Brooke Bishop and Daniel Landberg interviewed dozens and dozens of couples, then sought to distill what they had experienced and learned into a piece of theatre. Six actors -- Claudia Crook, Eduardo Fernandez-Baumann, David Hartstone, Briana McLean, Samantha Smart, Paul Weinberg--perform ten characters, five couples who simply tell/enact their love stories. Simply. How ironic to use that word for what they do. Both utterly correct and totally misleading. Love at first sight. Love growing from friendship. Crushes turning into love. Love unlooked-for after losing the hope to find it. Love arriving with zero warning at a blind date that grows into something deeply real. Love challenged, almost destroyed, love that tempers and teaches and sometimes chastises. The stuff of individual stories we see around us all the time. Plenty of marriages and couples last for the long haul, we know this if we bother to take notice. Not without bumps and potholes along to road, nor lacking terrible mistakes and sometimes misunderstandings that lash and wound and bleed. But. It. Does. Happen. It isn't even particularly rare. We do sometimes need reminding of that, don't you think? The show has one major disadvantage from the get-go, one they manage to work around pretty cleverly. How Love Lasts in fact runs on the same stage--more importantly on the same set--as the regular show Bed. It interferes with audience sight lines, so I do recommend you seat as close to the center and as high as one can manage. However, I will also note whole chunks of the play take place pretty much within the audience! A very clever solution! And one that increases the sense of intimacy, that visceral sense one is simply listening to real people recount some of the journey of their lives. Childhood sweethearts. A man and woman who meet and click while dancing at a club. Two men, one closeted, hooked up by a friend. A housewife unhappy in her marriage finding more than she could imagine in the arms of another woman. Two people who simply meet, like each other, until like becomes more and more. Anger and loneliness, disappointment and acceptance, change welcome as well as resisted. And not one moment of this would work without a cast willing to take it absolutely seriously. This remains key to almost any performance, but in such an almost quiet collection of human connection, the temptation for cloying saccharine must have hovered in the air. But this cast rejected it. We the audience got not a lecture or a bunch of simplistic mottoes. Rather we just felt as if these were real people, finding in each other more than just a warm body in the night. More than a hand to hold when things got shaky.